USA's Andy Roddick plays Serbia's Novak Djokovic. Watching the Olympics this time around, I was struck with a realization: This year, tennis players would be playing on grass. Well, obviously, you might be thinking. The 2012 Olympics are taking place in a city with arguably the most storied tennis history, given that the grand slam tournament Wimbledon, the oldest tennis tournament in the world, takes place there every year. But after doing some mild digging, I discovered that this is the first time since the 1920 Olympics in Antwerp that tennis has been played on grass, and perhaps more notably, the first time since the games have been reintroduced as a medal sport, which was in Seoul in 1988. Interestingly (to some anyway), the last time anything other than a hard court was used at the Olympics was in 1992&apos;s Barcelona games, when games were played on red clay. In the very early years, wood courts were actually used. Just because the events are taking place at Wimbledon doesn&apos;t mean everything else stays the same; for instance, the players certainly don&apos;t have to wear just white, and are donning their nation&apos;s garb. And perhaps equally surprising, the tennis stars, most of whom are known to have favorite surfaces, are not too disappointed about this fickle surface. 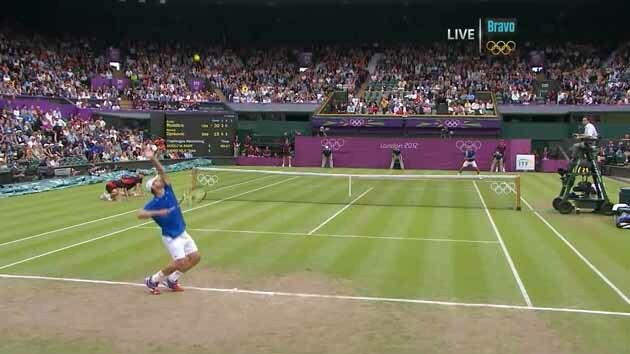 "I&apos;m excited the Olympics are on grass as it&apos;s a surface that I favour," team USA&apos;s Andy Roddick said. "I&apos;ve been looking forward to it." Oh and in case you&apos;re wondering: the Associated Press reports that the ryegrass used on the Wimbledon court&apos;s is as "immaculate as ever" because of "cooperative weather."